After many attempts with timers, I finally picked up a shot that had lightning strikes across the skyline before a storm. It’s only one exposure, at 2 seconds. A view of the skyline while watching fireworks nearby, Memorial Day weekend. On the eve of the eve, I captured the Bean as it started to snow. It was a cold and icy night. The Chicago River with floating blocks of ice just near the Merchandise Mart. It was a cold, misty night so having a picture turn out well was fortunate! Calder’s Flamingo in Chicago’s Loop. 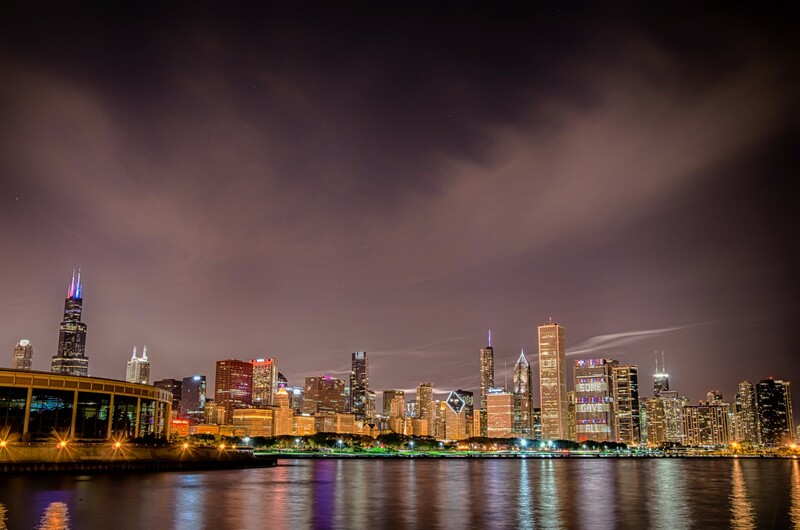 A 1 second exposure taken from a sunroof driving along the “S” curve of Lake Shore Drive in Chicago. © Raf Winterpacht and Chicago Photo Concepts, 2007-2017. Unauthorized use and/or duplication of this material without express and written permission from this site’s author and/or owner is strictly prohibited. Excerpts and links may be used, provided that full and clear credit is given to Raf Winterpacht and Chicago Photo Concepts with appropriate and specific direction to the original content.